A large explosion – thought to have been caused by a car bomb – has struck the centre of the Turkish capital Ankara, killing at least two dozen people and injuring scores of others. According to reports quoting the Turkish health minister, the attack has killed at least 34 people. Earlier, security officials put the death toll at least 32. The governor’s office initially said 27 had died. Some 75 people have been injured in the bombing and have been taken to various hospitals around the city. 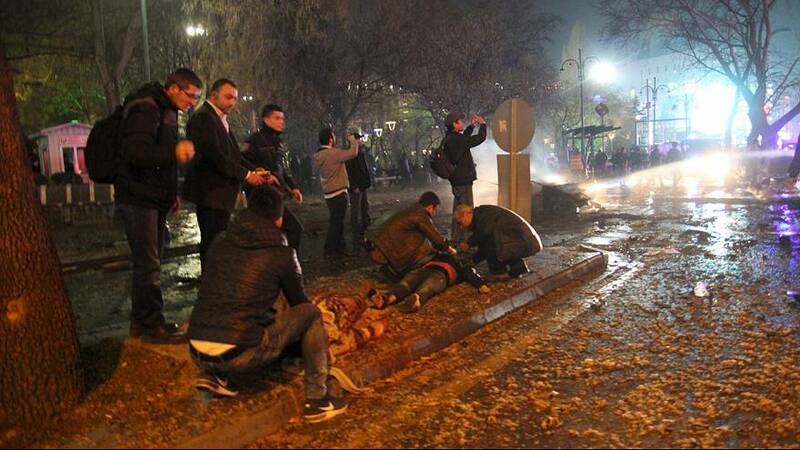 The blast happened just before 6.45pm local time at Kizilay Square near the central Guven Park. The area was said to have been crowded at the time – it’s near a courthouse and the Justice and Interior ministries. The state broadcaster TRT said the car exploded at a major transport hub – several bus stops are located there – hitting a bus carrying some 20 people. The blast was heard several miles away and left a large cloud of smoke rising over the city. Some reports – unconfirmed – say gunfire was also heard after the explosion. A Turkish security official was quoted as saying initial findings suggested the attack was carried out by the Kurdish militants the PKK or an affiliated group. The main Kurdish party the HDP has condemned the bombing. Prime Minister Ahmet Davutoglu convened an urgent meeting of the Security Council after the bombing. Reports from Turkey say national media have been banned from reporting the latest explosion, in line with restrictions imposed in recent months. A court in Ankara ordered a ban on access to Facebook, Twitter and other sites in Turkey, after images from the car bombing were shared on social media – according to broadcasters CNN Turk and NTV. Breaking News: Broadcast ban reported imposed on #Ankara explosion coverage. This is the third major attack in Ankara in six months. The blast comes less than a month after a car bomb attack on a military bus in Ankara killed 29 people. Kurdish militants claimed responsibility for that attack. Last October more than a 100 people were killed in a suicide bombing at a Kurdish peace rally in the city. Militants from the self-proclaimed Islamic State have also carried out several attacks since last summer – including a suicide bombing in Istanbul in January which killed 10 German tourists. The US embassy had warned two days ago that there was information regarding a potential attack on a government building in Ankara – but the site is several kilometres away from the scene of tonight’s blast. Turkey, a NATO member, is facing security threats on several fronts – notably from Kurdish militants and from ISIL from its base in neighbouring Syria – where it’s part of the US-led coalition.